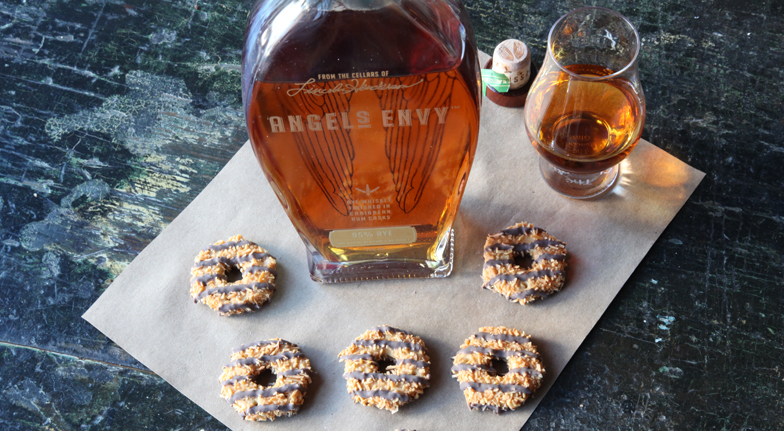 To some, it might be sacrilege, but for this former Brownie, it’s a divine pairing: Bourbon & Girl Scout cookies. You don’t need to have earned a patch to appreciate the nuances of nibbling the sweet treats while sipping a well-crafted beverage. In honoring the métier of entrepreneurial young women, The Bourbon Review was faced with a serious task. 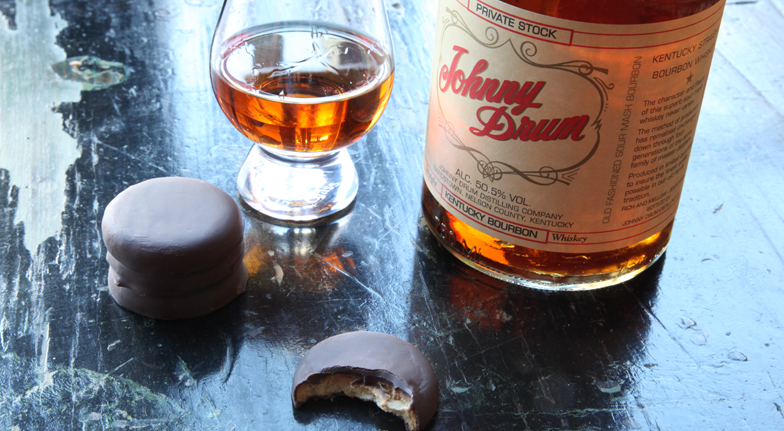 Determining which Bourbons would taste best with these time-honored treats would require integrity and an open palate. We were up for the challenge. To aid us in our tasting, we enlisted the expertise of Adam Geissler, a renowned Beverage Consultant in Lexington, Ky. Plenty of samples were required, naturally. Based on flavor profiles and our nostalgic appreciation for the cookies, we tasted, sipped and ruminated – all for you, dear readers. 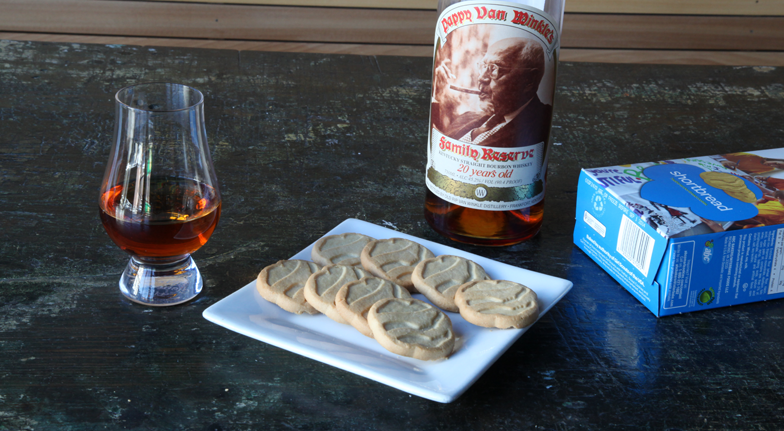 Our method involved a neat tasting of a variety of Bourbons with each cookie. 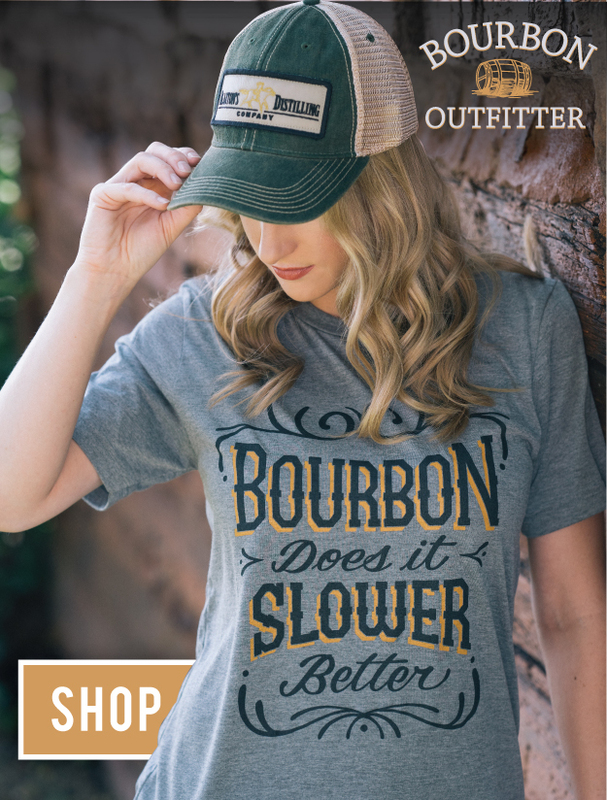 Typically, we would first take a bite of the cookie, followed by a sniff and measured sip of the Bourbon. Then we would follow with another bite of the cookie. This process allowed us to get a good sense of how well the taste and scent of the two combined. One of our discoveries is that like tends to go with like. For example, if a Bourbon has fruity flavors, it will go well with a fruit-flavored cookie. In some ways, this is counterintuitive, but surprisingly successful. If you stage your own pairings, we strongly encourage you to experiment beyond our picks. The delectable combinations are endless. For the top-selling Girl Scout Cookie in America, we had to get it right. 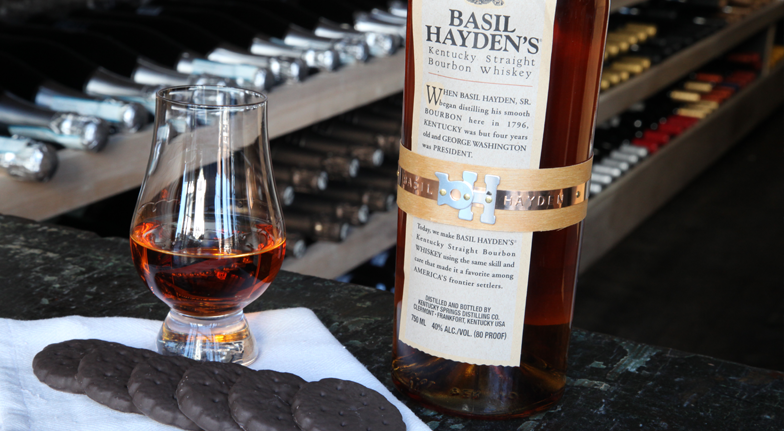 Happily, the small batch Basil Hayden’s has a slight peppermint taste that pairs wonderfully with the classic chocolate mint confection. The rich combination of peanut butter and chocolate initially seemed to be a daunting contender. Would the peanut notes in Johnny Drum create too cloying of a taste, we wondered? Not at all. In fact, it was a perfect match. Geissler intuitively suggested this surprising coupling on the first try. 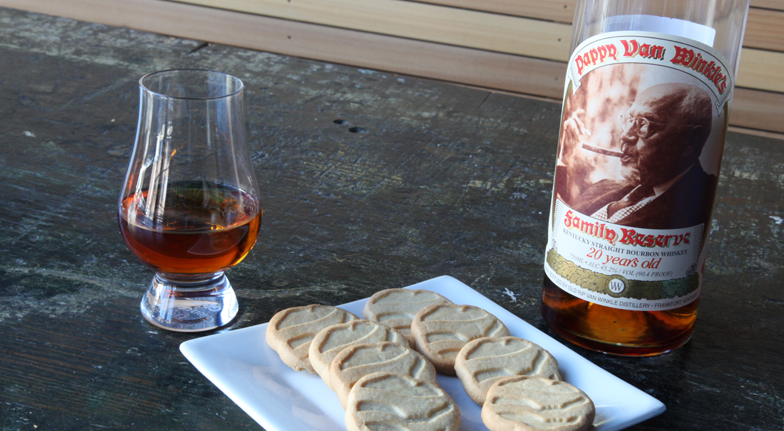 As he points out, with this variety of Pappy’s heavy oak flavor, “so much of the whiskey has already gone to the angel’s share, so you get a lot of sweetness with this simple, delicate cookie.” The light vanilla flavor of the Shortbread is an excellent foil for the complex Pappy. As one of our taster’s favorites, the pressure was on for this one. The caramel and chocolate treats called for a libation with similar undertones, and the brown sugar and cinnamon notes in Angel’s Envy Rye fit the bill. 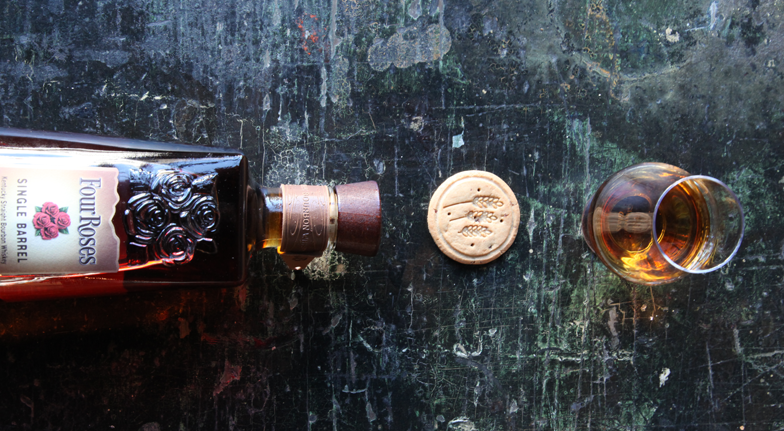 Aged in Caribbean Rum casks, the Rye is a delightful companion for the sugary snack. Knowing that Four Roses Single Barrel contains plum and cherry flavors, we postulated that it could create an interesting meeting of the minds with the Cranberry Citrus Crisp. Indeed, the fruity Bourbon was a luscious pairing for this underdog cookie.